export CC="gcc -flax-vector-conversions -O3 -falign-loops=16 -falign-functions=16 -falign-labels=16 -falign-jumps=16"
export CXX="g++ -flax-vector-conversions -fpermissive -O3 -falign-loops=16 -falign-functions=16 -falign-labels=16 -falign-jumps=16"
I was able to compile Arctic Fox 27.9.15 on Lubuntu 12.04.5 LTS PowerPC today. I had to add the GCC 4.8 and the libatomic1 via the repository 'ppa:ubuntu-toolchain-r/test'. 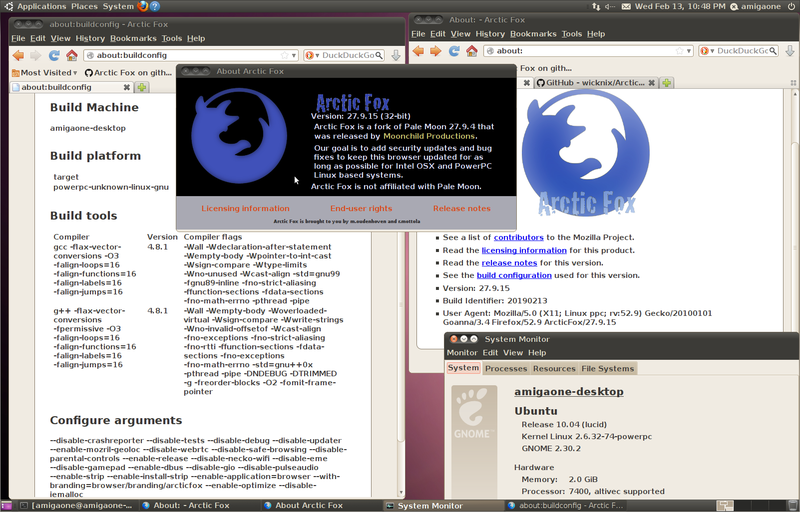 Normally it isn't possible to compile Arctic Fox on Ubuntu 12.04.X. 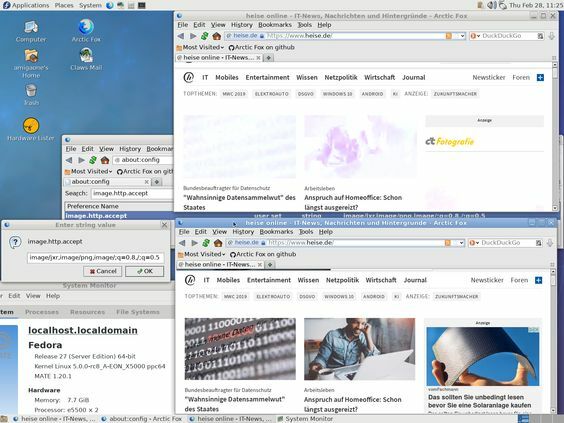 I successfully tested it on an installed Lubuntu 12.04.5 LTS PowerPC and on a Lubuntu 12.04.0 PowerPC live DVD. Additionally you need the libatomic1 package. 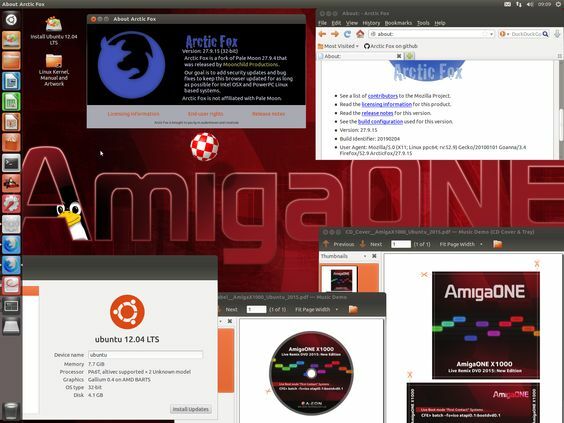 BTW, it works on the old A-EON Ubuntu Live Remix DVD for the AmigaOne X1000 too. 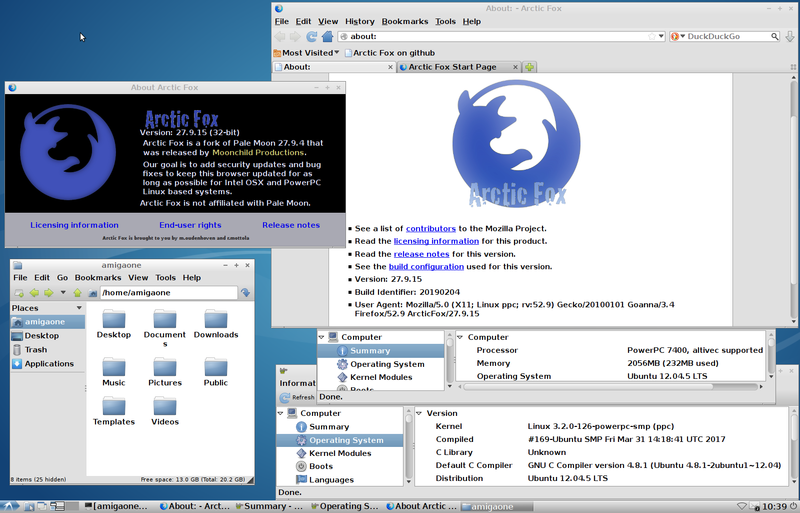 I was able to compile Arctic Fox 27.9.15 on Ubuntu 10.04.4 LTS PowerPC today! I had to add the GCC 4.8 and the libatomic1 via the repository 'ppa:ubuntu-toolchain-r/test'. Additionally I had to compile Python 2.7 because Arctic Fox depends on Python 2.7. Now, Arctic Fox 27.9.15 works on a nine years old Linux system! I will test it and after that I will try to release it. I released a test version of Arctic Fox 27.9.15 for Ubuntu 10.04.4 LTS PowerPC (Lucid Lynx) today. Maybe it works on Debian 6 (Squeeze) too. Please note: It doesn't work on Ubuntu 10.04.0. You need Ubuntu 10.04.4. Unfortunately 'mach package' doesn't work on Ubuntu 10.04.4 so I had to create the package manually. That means, the package is much bigger than the default package. 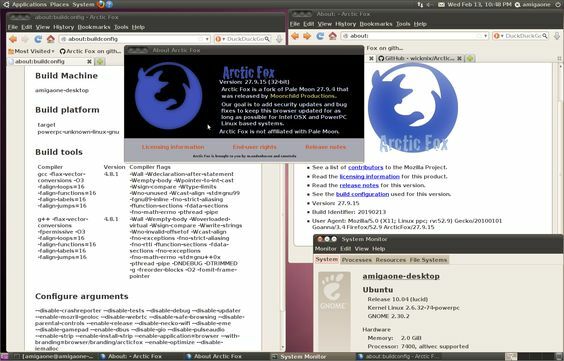 However, Arctic Fox 27.9.15 works fantastic on Ubuntu 10.04.4. The default old web browser Firefox can't access many websites anymore. 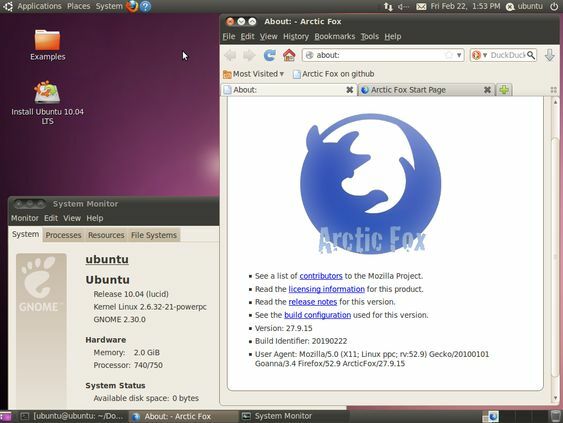 Arctic Fox is faster and brings Ubuntu 10.04 back to the web. Maybe you need Python 2.7 as well. I had to compile Python 2.7 because Arctic Fox depends on Python 2.7 but it wasn't difficult to compile it. I was able to solve the problem with mach package today. 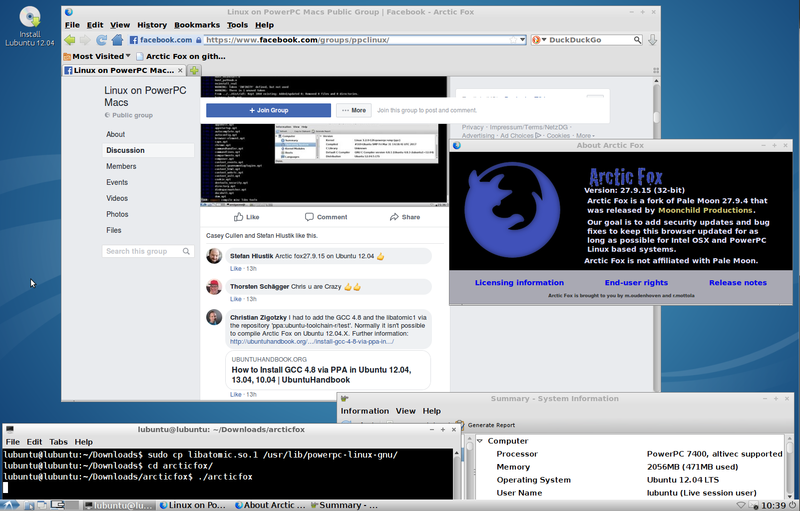 Arctic Fox 27.9.15 works on Ubuntu 10.04.0 LTS PowerPC (Lucid Lynx) now! You don't need Ubuntu 10.04.4 as a requirement anymore! 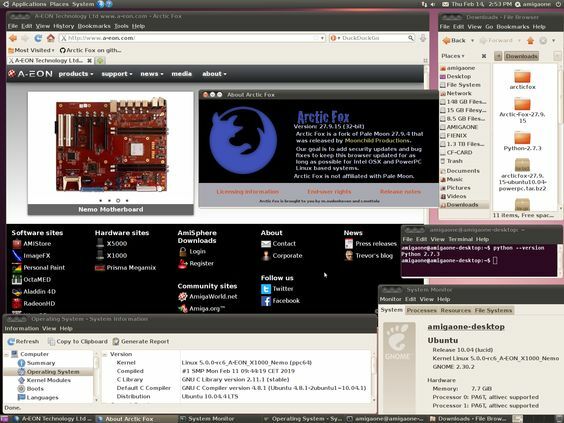 I successfully tested it on the Ubuntu 10.04.0 Live DVD today. You don't need to install Python 2.7 anymore but you need to install the GCC 4.8 and the libatomic1 via the repository 'ppa:ubuntu-toolchain-r/test'. Reload that website. The images should look correct now. There is an issue with WebP on PowerPC. Sometimes you get washed out images. Wart Hog Matt has a workaround for this issue. I tested it today and it works! I reloaded the problematic website. It's very important to reload the website because if you don't do it, then it only opens the website from the cache. Many thanks to Wart Hog Matt for this workaround!